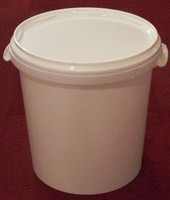 30ltr Heavy Guage, food grade brewing bin which is ideal for making beer or wine, or for possibly converting to a 25ltr home made hot liquor tank. This 30 Litre Brewing bin with lid made from high density, food grade plastic which is ideal for fermenting larger batches of beer to save time and effort. It is also suitable for converting for use as a hot liquor tank when making all grain brews, as it will happily withstand water temperatures of around 80-85°C without softening. There are plenty of "how to" guides available on the web, showing how to remove the heating elements from electric kettles and then adapt them for use as a home made boiler. Whilst this bucket is made from food grade polypropelene and thus nominally capable of withstanding the temperatures generated whilst boiling wort, the walls of the bin are not as thick as those on an Electrim Bin and may not be as sturdy during an extended boil. If you choose to follow any of these guides, we would always recommend that you have your work checked by a qualified electrician or other competent person to ensure that you maintain your own safety and that of those around you. We accept absolutely NO responsibility for any injury whatsoever if you choose to use it for any other purpose than as a fermenting bin.